Greetings friends! Ready to drive through the mountains and experience the beautiful scenery that Notthern Arkansas has in store for us again ? 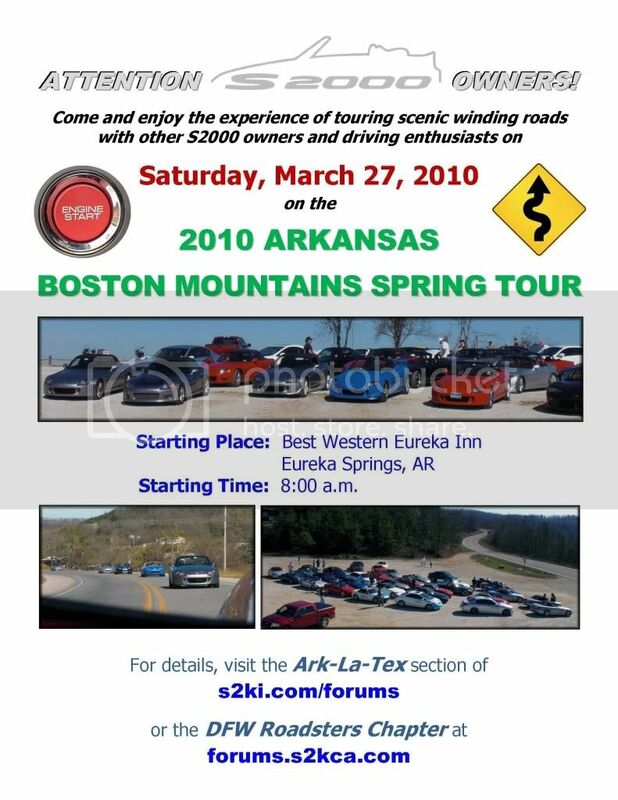 Planning is well underway for the seventh semi-annual all-day S2000 tour through the Arkansas Boston Mountains. Weather permitting. Here it is, Boston Mountains Tour Spring 2010!!! Hotel Information: For those driving in the night before. 1-800-221-3344 Mention you are with "Boston Mountain Tour Group"
We have a block of 12 rooms set aside. Group rate price is $89.95/Night with Full Breakfast. This Tour, like previous tours, this will be [SIZE=7]limited [/color] to 50 cars.Please Post up so I can add attendees (by state). We would like to get an idea so reservations can be made for lunch and dinner. If you're not certain if you can join us please let us know as soon as possible. FYI, our lunch stop will be very similar to last Fall. We'll have a buffet set up at The Arkansas House in Jasper . The buffet will consist of salmon, chicken, brisket, salad, potatoes, drinks and dessert. 1. The price per person for our private buffet will be $16.35 which includes meal, drink, tax and gratuity. Meals must be paid for in the Cafe (cash or credit card) and a token must be presented to receive a plate at the serving line. Dinner Information Added 3/19/10: Dinner will take place after the tour at The Rowdy Beaver. Many are already familiar with this place and some of us will actually be eating there Friday night after we arrive to town. They will have a buffet set up for us: Roast Beef/Chicken/Corn/Mashed potatoes/Salad and Soup Bar. The Price for this is $21.07 per person, which includes: Meal, full Soup and Salad Bar, Drink, Tax, and Gratuity. As with any tour, and I will remind again as we get closer to the event, make sure you inspect you car (i.e. TIRES, fluids, ect.). Please arrive at the meeting location on time and with a full tank. There has not been a real need for passing, so there will be NO passing on this tour. Most of these roads are not safe for passing anyway because of all the turns. Added 3/1/2010: BMT Pre Drive Saturday March 6. If you plan on having a +1 make sure to update or PM me so I can add it to my total. Bolded names are those that are confirmed. Names not in bold are not confirmed. P.S. Let me know if you need help with anything. Not sure that I would be a good leader but I can sweep/help with other things. Well you can count me in!!!!!!! If you need anything let me know and I will try to help. Add me. I will have the HPDE the weekend before so maybe it will help out. If Grayson/Jordan or anyone else want to caravan to AK or need a place to crash before heading out, lmk. Although a rookie, noob, happy to help. My wife and I are in! Looking forward to another great drive!